At Shalendy Dairy we had a problem with high temperature of our cooling water which caused problems getting the milk cooled sufficiently before collection. Russell Corfield of R. Corfield Refrigeration and Electrical Ltd, did some research on our options and came up with a proposal to use precooled water which is recycled through the plate cooler and then returned to the 30000litre reservoir for re-chilling. 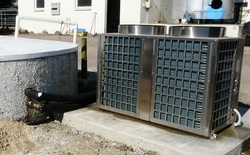 His company did the installation of the water cooling unit and electrical work. After completion extensive monitoring of water temperatures, milk entry to the vat temperature and the changes during cooling in the cooling water reservoir- these were all compared with the monitored temperatures pre installation and significant improvements have been achieved. We were very impressed with the service, communication throughout, speed of installation and final results of the milk temperature entering the vat (19-20* pre installation and 9* since). We anticipate power savings overall as the vat chiller is working far less than before and also the system recycles the water thus saving on water use.